Font color=red>The dangers of delivering eggs. The rhythm of Claudino González Flores' life is dictated by the ebb and flow of Rio Cañas Blancas. 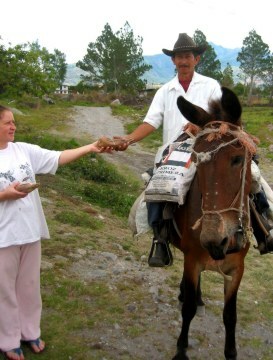 He has to ford it 12 times with his horse between his small finca in Cañas Blancas Alto Bonito and his 80-plus customers in Paso Ancho and Volcán. Awake at 4 a.m., the trip takes about five hours and is timed to get him into Volcán at about 9 a.m. Rain or shine, he serves his customers until about 10 at night before beginning the long trip home, arriving there at about 3 a.m. the next day. The schedule allows him to reach the river at both ends of his trip when the water is usually low enough for his horse to cross. Once a week he delivers eggs, cheese and bienmesabe, which means "tastes good to me" in English and is a sweet-tasting type of sponge cake made with rice, milk and sugar cane. 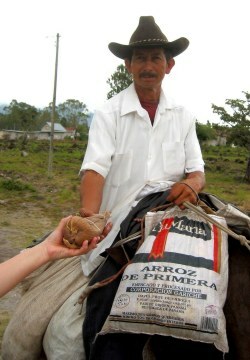 His produce is carried in rice sacks which are draped from his saddle. The eggs are wrapped carefully, three at a time, inside corn husks tied with fine cord. First sight of him at the gate, cowboy hat shielding his head, is a novelty for ex-pats. Brits had eggs, cheese, butter and milk delivered by horse before World War II. The horses pulled carts and knew which roads to take and which houses to stop in front of, but the war and insufficient meat production lead to their slaughter for food. Today, much less interesting electric carts ply the milk routes; the horses are but a fond memory for those old enough to remember them. Claudino, who works on his finca the rest of the week, has been serving his route now for 30 years, since he was a young man of 26. His eggs are fresh from chickens close to his home and the bienmesabe and the cheese that is typically eaten with it, are made by neighbors. For those of us from other lands, Claudino is a refreshing reminder of simpler days in our past. As we were going to press with this article we heard of a heartbreaking tragedy. Thieves had stolen some of Claudino's prize chickens. He stayed at homes trying to sort our where his animals had gone and handed off delivery of the eggs to a friend MARTIN ALVAREZ. We were informed by the Police detective agency (DIJ) that Senor Alvarez had drowned while fording one of the flooded rivers. Many of us here in the highlands of Panama take for granted the food that we receive each day - sometimes that food comes at a very high price.